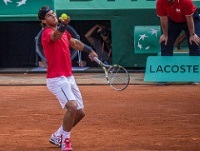 Many tennis fans consider the Rome Masters to be the second most prestigious clay court tennis tournament in the world, after the French Open. The ATP Masters Series consists of nine tennis tournaments that are held annually in Europe and North America and sees the world's top tennis players competing for the title of world number one. The Rome Masters has officially been called the Internazionali BNL d'Italia since 2002, but the old name is still more commonly used among fans. The Italian tennis championship was first held in 1930 in Milan. Rafael Nadal is the most successful player in the Rome Masters to date. The Rome Masters is a fun tournament to attend and the crowds are passionate and less polite and formal than you might find at tournaments like Wimbledon.